The App Store is improving. I know we’ve said it many times before, but we really do think that apps these days are generally better in terms of quality. Many developers are pushing to create original apps that stand out from the rest. A case in point is today’s app pick, Loopy Lost His Lettuce by Adelaide-based developer Pixelflip Studios. Whereas other apps use digital images, this interactive book-app turns to old-world elements: all the objects in the app, including the characters and the backdrops, were individually crocheted by hand. The result is a visually striking app that promises to delight its readers. Comprising of 30 interactive pages, Loopy Lost His Lettuce is an original tale about a hungry snail who is on a mission to find his lost dinner. He meets with various inhabitants of the forest, who agree to help him in return for a small favor. Thus begins Loopy’s journey through the forest and eventually, the four seasons. An engaging app, Loopy Lost His Lettuce features lots of animations and interactivity. Crocheted flowers bloom where you tap on the grass, sneaky woodland creatures come out of their hiding places when touched, and wooly clouds drift across the sky. Also available are six fun mini games integrated within the story. A game usually begins after Loopy meets with a new friend, and involves simple but fun tasks like tapping to collect butterflies, shaking your iPad to collect acorns, tilting your iPad to navigate through an underground maze, matching snowflakes, and so on. Interestingly, these games are available in three levels — Easy, Medium, Hard — to accommodate different players. The app supports Game Center, so you can submit your high scores to the leaderboard and collect fun achievements like completing the story, finding the lost lettuce, finding hidden objects, and more. - Mumma Butterfly. A simple tapping game in which you try to catch as many butterflies as you can in 60 seconds. - Sneaky Squirrel. Help a squirrel collect as many acorns in 60 seconds by shaking the trees (your iPad) and gathering the fallen ones. - Bumby Bee. Help a bee collect pollens by tapping and holding on all the flowers on the screen, one at a time. - Wriggly Worm. Find your way out of the dark maze by tilting the device. - Mr. Snowman. 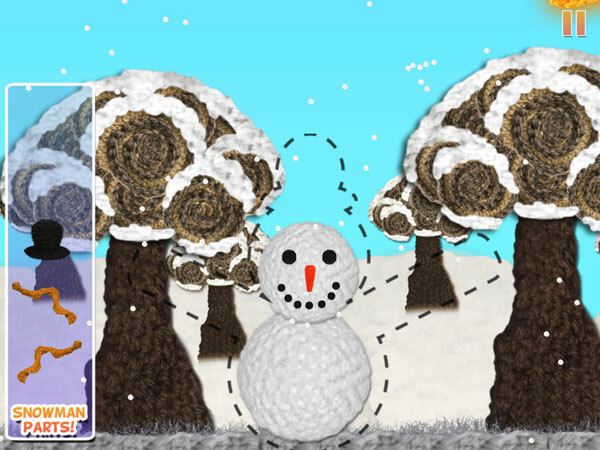 Rebuild a snowman by collecting his body parts and dragging them to their rightful places. - Snowflakes. A simple matching game to find all the snowflake pairs. Like most digital storybooks nowadays, the app comes with two reading options, Read to Me or Read by Myself, so it is great for both early readers and older kids. Parents need to know that the app supports Game Center, and an Internet connection is necessary to post high scores to the leaderboard. I find that this feature adds an extra layer of fun as competitive kids will come back to the app to unlock achievements. However, if you don’t want it, you can turn it off from the main menu. 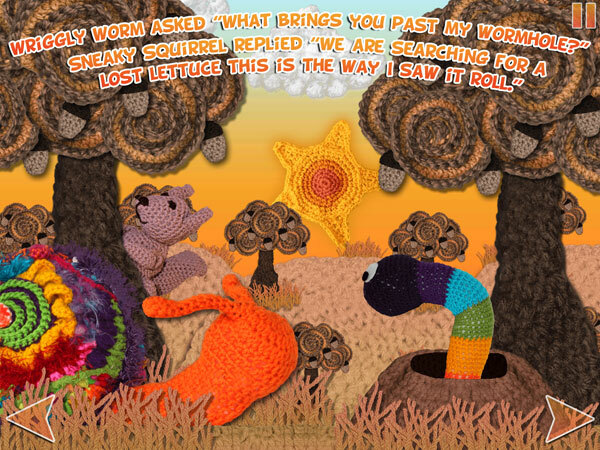 A truly unique app, Loopy Lost His Lettuce won me over with its colorful, handmade graphics. I really don’t know nothing about crochet, so I can only imagine the amount of time and effort that it took for the artist to make all the objects in the app! Accompanying the artistic graphics is a set of original soundtrack that is delightful to listen to. I appreciate that there is a unique track for each mini game, it keeps the app from being repetitive and boring. The sound effects make the scenes lively and engaging. The story is really enjoyable too. It is kid-friendly, and it contains positive messages about determination and teamwork. It is also quite lengthy, but it makes a suitable reading material for grade-schoolers. On the other hand, you can easily split the book into several bedtime story sessions for younger juniors. If there is one flaw in this otherwise perfect app, it is that the narrator is a bit flat in my opinion and there is no word highlighting. However, these are minor issues and honestly, the rest of the app is so good that I am willing to overlook these matters. The app has six fun mini games integrated in the story. Here, kids Help Loopy rebuild the snowman. Loopy Lost His Lettuce is a terrific app that has all the right ingredients to be a hit with your kid: a positive story, appealing visuals, and excellent interactivity. I loved reading it, and I wouldn’t hesitate recommending it to parents with kids ages 3 to 9. Bartleby's Book of Buttons Vol 1: The Far Away Island. An adventurous tale filled with clever puzzles to tingle young minds. The Fantastic Flying Book of Mr. Morris Lessmore. A beautiful tale of self-discovery, based on an Academy Award-winning animation. Puppet Workshop - Creativity App for Kids. Make your own odd characters with colorful socks and gloves.